We often think of vacations as the time to let go, forget about diets and exercise, and just do whatever we like. While that can certainly be the case, it can leave us sluggish and make getting back into a routine more difficult when we get back home. That's why you should be able to engage in healthy living while still enjoying yourself, and you'll be able to enjoy the benefits of good health at the San Pedro Belize Fitness Club on Ambergris Caye. You shouldn't have to feel obligated to work out, you should enjoy it and move at a pace that best suits your body and activity level. 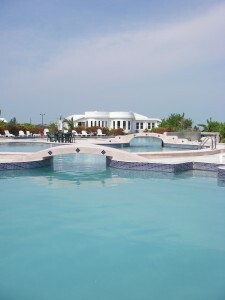 That's why this Ambergris Caye fitness club gives you so many options, including the largest swimming pool on the island and a high-tech gym full of some of the most advanced equipment so that you can keep in shape the way that best suits you. Whether you're looking for intense cardio or to get some weight training in, there is something to suit your needs. Even if you don't require a guide to your workout, our staff is ready to help you in any way they can, from giving instructions on how to operate some of the machines to giving suggestions for other healthy activities you might take part in outdoors or around the island. There is plenty to do, and if you start to get bored of one activity, you can always move on to something else without ever worrying about running out of stuff to keep you going both mentally and physically. But, you don't have to worry about your health alone if that's not what you want. The San Pedro Belize, Ambergris Caye offers a number of different group classes that you can also participate in. Maybe you're looking for a good aerobics class that will keep you moving and in the best shape, or perhaps you're more interested in a group yoga session with a trained and experienced instructor. There are so many options for all levels of participant from beginner to expert. And, that doesn't even take into account the various outdoor sports that you can share with your friends, family and neighbors. Take a look at the expertly kept tennis courts that remain lit at night to take advantage of cooler temperatures in the warm months. You can practice your short game on the putting greens or with the miniature golf track if you like a bit more of a challenge, and then you can take those skills out with some friends to the immaculate golf course. There's no reason why exercising has to be a chore. Instead, it can be a fun part of your day, the activity that you look forward to every night before going to bed. It can be time on the treadmill or hours with a racquet in your hand. It can be indoors or outside, alone or in a group, whatever gets you going so that you live the best, healthiest life you can.